How Important Is Your Screen Door Hardware? There’s an old saying, a chain is only as strong as its weakest link. And, with many screen doors, the weakest link is usually the hardware. After all, once you’ve found an attractive and durable door, who wants to spend more time researching all the smaller components that go into making it work properly? However, when you’re shopping for a screen door replacement, it’s important to consider the hardware. Because, unfortunately, if you wind up with shoddy hardware, the best screen door in the world won’t be effective in keeping bugs out and will cost you more money in repairs down the road. So, to save you time and money, here’s a quick guide to screen door hardware. doors come with a single durable piano hinge as standard. A piano hinge is a continuous hinge that runs the full length of the door, providing, among other benefits, total long-term support for your door. 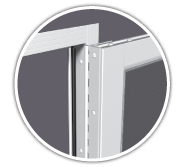 The z-bar attaches to the side of the frame on which the door opens. 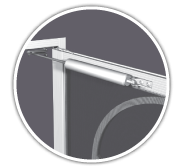 Everyone has heard that horrible slamming sound when a screen door closes too fast on a metal z-bar. Besides the noise, that kind of repeated impact isn’t good for the door. That’s why all PCA screen doors come with a wool pile lined z-bar providing a quiet close and a tight seal. Wool pile saves the door from the stress of repeated banging. It also provides a tighter seal, helping to make sure bugs stay outside where they belong. Your screen door handle, like your hinges, gets wear and tear every single time you use your door. We’ve all seen how broken, banged up, and rusted a cheap screen door handle gets over time. All PCA handles are rust free screen door hardware, so they stand up to years of heavy use. Consider using an ergonomic handle that’s easier to open and close, like our EZ-Pull Handle, meaning less wear and tear on it as well as on your hands. 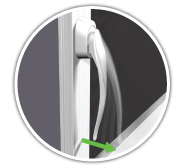 And if you need a high quality screen door handle for an in-swing door, our Albright In-Swing Handle was designed specifically for you. If you’re looking for more security consider our Key Lock Handle or Screen Door Deadlock. And if you’re looking for a color-matched screen door handle, PCA screen doors come in five colors with all hardware color matched to the door. There’s nothing worse than a screen door that’s flapping in the breeze because the pneumatic closer tube has become unfastened from the door. Be wary of aluminum brackets holding the tube in place; they don’t hold up over the long term. Stainless steel brackets perform far better and keep the door in good working order. French screen doors usually require an additional piece of hardware – a center post between them so that each door closes securely. 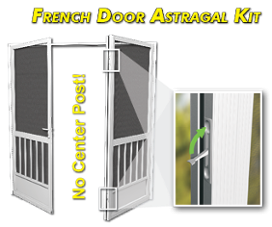 But, with our French Door Astragal Kit, you can do without a center post, giving you the convenience of an unobstructed double-door opening. You’ll be able to move furniture and other bulky items in and out, and have a large entrance to your outdoor patio for entertaining. Those are some of the things you need to consider about the hardware for your screen door. 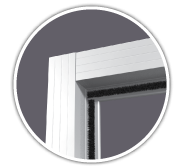 Finally, know that when you buy a PCA screen door, all necessary hardware is included, made of quality material to stand up to years of use, and color matched to your door.